An IRA bomb survivor has called on the mayor of San Francisco to rescind a posthumous award honouring Martin McGuinness's "courageous service in the military". Mary Hamilton said an apology from mayor London Breed has "come too late" for IRA victims. Mrs Hamilton was injured in the 1972 Claudy bomb. Mr McGuinness has been awarded a Certificate of Honour, the equivalent to a "freedom of the city" award. 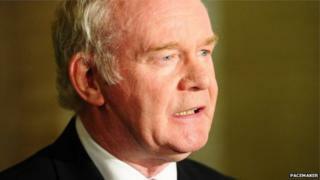 IRA victims criticised the honour, which also recognises the former IRA leader's role in the peace process. On Monday DUP leader Arlene Foster invited Ms Breed to Northern Ireland to see how "terrorism still causes pain". In a statement, the mayor explained that Mr McGuinness had been selected as one of five Grand Marshalls for the award. "As part of San Francisco's annual St Patrick's Day festivities, the Mayor of San Francisco has traditionally provided Certificates of Honor to the Honorary Grand Marshalls selected by the United Irish Societies of San Francisco," she said. "San Francisco values mean respect for the democratic process and non-violent political actions. "The language on the Certificate of Honor should have taken more care to apply these values when reflecting the history of Mr McGuinness's life towards peacemaker and his role in the peace process that resulted in the Good Friday Agreement." Ms Breed said she apologised for "the pain this certificate has caused". But Mrs Hamilton said the award to Mr McGuinness should be rescinded. Now an Ulster Unionist party councillor, the former deputy Mayor of Derry, whose brother-in-law George Hamilton was also shot and killed by the IRA in 1972, said she broke down when she heard about the award. Mrs Hamilton said she believed them Mayor of San Francisco, who signed off on the award, had been ill-informed. "To me the mayor should have visited Northern Ireland to see the legacy that has been left behind," she added. She is among a number of IRA victims to criticise the award. Ann Travers said she was "completely sickened" by the honour. Her sister Mary was murdered by the IRA in Belfast in 1984. The target of the ambush was their father, Tom, a resident magistrate. He survived. "There was nothing courageous about the IRA. As far as I am aware they were not a military organisation but a terrorist organisation. "Martin McGuinness left behind as his legacy, people with a huge amount of hurt," she said. Margaret Veitch, whose parents died in the IRA Enniskillen bombing, told the Belfast Telegraph the former deputy first minister, who died in 2017, had gone to his grave "an unrepentant terrorist". "Terrorists are terrorists the world over, except in Northern Ireland where they are put into government and given awards," she said. She added: "I don't know what's wrong with people that terrorists are now being honoured. Will San Francisco now be giving a posthumous honour to Osama bin Laden?" Mrs Foster, the former first minister, has written to Andrew Whittaker, the British consul general in San Francisco, to pass on a letter to the mayor of San Francisco which details "some of the IRA's activities" and extends an invitation to visit Northern Ireland to "find out first-hand from those who suffered from their terrorism." In a statement, Mrs Foster said that Mr McGuinness "undoubtedly played a very important role in the restoration of devolution" in his later life but "the earlier part of his life was one of violence". Image caption Martin McGuiness served as Deputy First Minister with Arlene Foster as First Minister until he stood down in January 2017. She said Mr McGuinness was "commander of the Provisional IRA Londonderry" during car bomb attacks in Claudy and Coleraine as well as the murder of Patsy Gillespie who was "used as human car bomb". Mrs Foster said these attacks are "likely to be unknown" to the San Francisco mayor. Ulster Unionist MLA Doug Beattie, a retired Army captain, also reacted angrily. He tweeted to the Democratic mayor of San Francisco: "I fought shoulder to shoulder with your country after the 9/11 terrorist attack. Yet you honour terrorists who butchered men, women and children in mine. #ShameOnYou." Mr McGuinness died at the age of 66 in 2017. He was second-in-command of the IRA in Derry at the time of Bloody Sunday. In 1997, he became MP for Mid Ulster, by which time he was Sinn Fein's chief negotiator in the peace process. By 2007, he was Northern Ireland's deputy first minister standing alongside First Minister Ian Paisley. A Sinn Féin spokesman said the San Francisco award was a "welcome recognition of the life and legacy of Martin McGuinness". "Martin McGuinness made a colossal contribution to the peace process, Irish unity and reconciliation," the spokesman said.